The morning of April 13th came up clear, as you can see in this photo that I took after we drove back the five miles from our hotel to Monahans Sandhills State Park. The flowering plant is Fouquieria splendens, called ocotillo (pronounced oh-ko-tee-yo), devil’s walking stick, and candlewood. The species is common in some of the desert regions of west Texas and farther west into New Mexico and Arizona and south into Mexico. Because ocotillo isn’t native in Monahans, but some distance south of there, it seems that someone had planted this specimen, which I found growing right outside the state park’s headquarters. Be that as it may, go ahead and remember this picture on July 4th if you’re looking for a red, white, and blue image to symbolize Independence Day in the United States. Good to see your imagination is fired up, and there’s also a connection to fire in the name candlewood. Devil’s walking stick seems about right. Nasty thorns. Nice flowers. I’ve read that the thorns develop from the petioles (stalks) of the leaves after the leaves fall off, which they are reported to do several times a year. This is a plant that’s highly adapted to living in the desert. Nice photo with a great composition. And a strange plant. Yes, it is a strange plant: I don’t think you’ll find anything like that in Norway. ‘Devil’s Walking Stick’ seems like such a harsh name for such a beautiful plant (although I guess it does look a little spikey…); ‘Candlewood’, however, seems just right! This is a really effective picture, love the way you’ve framed it completely against the sky. I find the plant beautiful too, but you can see why desert dwellers who had to contend with its thorns might have favored a diabolical name. I’m glad you liked the framing on this one. If there had been other, shorter ocotillos around I would have done some closeups of the flowers, but this was the only plant and its flowers were too high for me to get close to them (plus the wind was blowing), so I went for a broad view (and a fast shutter speed of 1/640 sec.). This is a gorgeous picture. Thanks, Shimon. Because much of Israel is a desert, I expect you must also have some strange native plants that are well adapted to those arid conditions. Beautiful composition. The first time I saw an ocotillo was at City of Rocks State Park in New Mexico. It was in full bloom. I’m glad that you got to see one in person, and in full bloom, too. 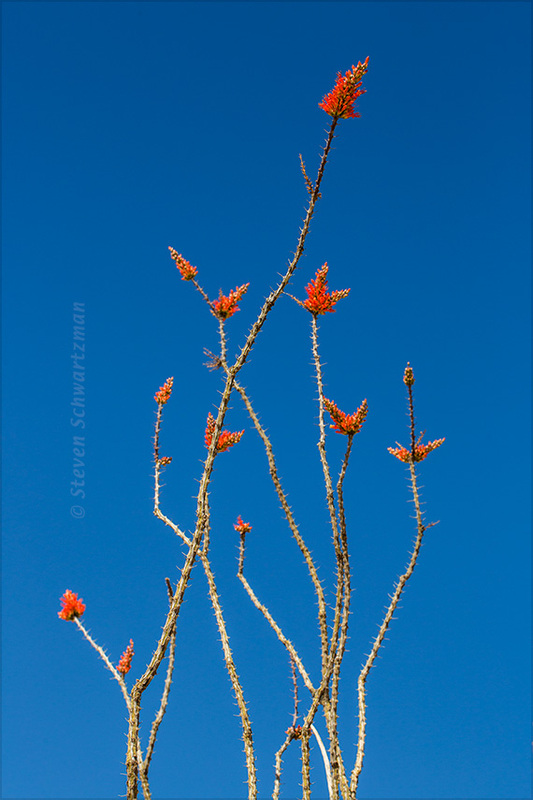 On some future trip to west Texas I’d like to do closeups of ocotillo flowers. It is a beautiful plant, and it’s easy to see how its various names could be related to how closely someone had to engage with it. I was fascinated by the note in the linked article that transplanted ocotillo need to be oriented in the same direction as in their original location, because they’ve adapted to more sunlight and heat on one side. I see the same thing applies to cactus. If I happen to bring a cactus home from the hill country, I’ll need to label the sunny side and account for that in my placement of it. My second thought upon seeing that you’d commented on this post was that heliotropism lives. I hadn’t realized that cacti are sensitive to the direction of the light as well. My first thought was the word ocotillo sung as if it were the Oklahoma! at the beginning of the Rodgers and Hammerstein song. I’d never thought that before, so I don’t know why it popped into my head now.